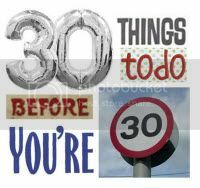 Challenge me: What 30 things do I need to do before I'm 30? Right, I've had a glass of vino and I've started thinking about my next birthday - it's a big one - the big 3-0 - Eeeeeek! I'd like to think that I've lead quite an eventful life so far but there are still quite a few things that I had hoped I might have done before I hit that fateful age. I did just set about writing an immediate list of things that I wanted to do but quite frankly - not wanting to be arsed with the challenge - I included quite a few things that I'd already done. I'm lazy like that! So, with that thought in mind I thought I'd ask you to set me (at least) 30 challenges instead. I promise that I will put my heart in to anything that you people of the blogosphere suggest (within reason!) but I'm hoping you come up with some truly amazing things for me to do over the next 322 days. I realise tis is a big ask but I would love for you to write a post about what you think some of my 30 things should be. You don't have to give me 30, just one will suffice and even better if it benefits a good cause. The only rule is that I must be able to complete the challenge by 28th July 2012. So go on - what are you waiting for? Tell me what you're 30 things were/would be or even better challenge me! I wont publish the ideas so be daring!